Life is a game. Sometimes a more enjoyable one and sometimes a bit less but we always need to continue playing it. In this blog, I will reflect on my personal observations on rules of the game and on how to change them. I will also share with you what I have recently read, came across and done. I hope you will enjoy visiting this site and that you will learn something new! The Anxiety of Learning is the title of a Harvard Business Review article offering a very interesting perspective on what motivates people to learn new things. The authors argue that unless they feel threatened, people are unwilling to learn. This blog post explores the idea further. It is a well known fact that people are resistant to change. We find comfort in status quo because even though it might not be the best thing possible, we at least know what we can expect from it and we have learnt how to operate in such system. It is the same case with learning – there is cost attached to it and this generates anxiety. As the authors point out, sources of this anxiety can be fear of looking silly when trying new things, the actual effort it takes us to learn something new, reluctance to part with our old habits or potential loss of the status we enjoy in the current system. All this contributes to our implicit unwillingness to learn new things. Yet you might argue that people still do learn and organizations or nations do change. You are of course right. Our society and its individuals have made huge progress over time. The authors attribute this to the other type of anxiety associated with learning; the fear of our survival. They go on to propose that people are willing to learn only when the ‘survival anxiety’ is greater than the ‘learning anxiety’. Consequently, one can motivate people to learn and change either by decreasing their learning anxiety or by increasing their survival anxiety. I think this is a really powerful idea which explains a lot of real life phenomena. Take for example the proverb ‘being thrown into the deep end’. People might be reluctant to learn to swim for whatever reason but once in deep water, they finally try. The same goes for learning a new language. Some people might be afraid to speak it because they think they will make a lot of mistakes. Once alone abroad however, they suddenly have to and realize that their command of the language is not so bad after all. This makes us think how we can engineer situations which would incentivise us or others to learn. Take for example organizational change which the authors mention as well. I was reading up on the topic when I was the president of AIESEC UK, a youth charity with over 600 members, and one of the key notions was activating the organization by making it plainly aware of the threads it is facing before taking it through a change process. It indeed was only when people fully realized the scale of challenges and got the right sense of urgency, that we could get on properly with creating strategies to improve the organization. I would like to end on a more optimistic note however. What learning ultimately boils down to is a cost benefit analysis. The view presented so far has been that learning happens when the cost of not learning is greater than the cost of learning. Rather than just playing with costs, we can also focus more on the benefits. Be them tangible, like specific (monetary) rewards, or intangible, like a feeling of contribution and satisfaction, I believe these can be good complements to our more deeply engrained sense of survival. The main take away for me is that we can actively influence how much we or people around us learn by structuring the environment in which the learning happens, our communication and the incentives we put in place. Give it a though next time you need to implement some change. I just read a really interesting article in the Harvard Business Review about what motivates people at work the most. Counter to popular belief and to what another survey suggested managers think, it was not recognition, monetary or otherwise, for work. Instead, making progress came as number one. The authors asked office workers to email them diaries at the end of every day saying how good the day was and what they did. 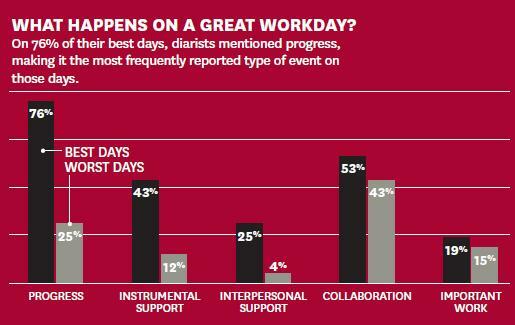 In 76% of great days, workers reported having made a progress (see the chart). While at first it might sound surprising, it actually makes perfect sense if you think about it. I also feel really good when I spend my day productively and make headway on important task and I guess I am not alone. This is good news because managers can directly influence how much progress their people make by setting clear goals with a number of milestones and giving support in achieving them, motivating their workers in that way. Recognition still came high up though, so we should never forget to recognize and celebrate success whenever an important step is accomplished. I have just read an interesting paper on three basic decision making models explained using an example of the Cuban Missiles Crisis. In October 1962 the USSR placed offensive nuclear weapons in Cuba prompting the US for a reaction. The paper looks at how the US arrived to a decision for naval blockade as opposed to e.g. an air attack. In doing so, the author describes three basic decision making models which I believe can be applied in any organization. Knowing them can help you as a decision maker to make better decisions or to influence others in making their decisions more effectively. This model assumes organizations have a unified set of preferences and they make choices that would maximise their benefits. If you want to influence decisions being made under this model, try changing the costs associated with certain alternatives. The higher the cost (and consequently the lower the net benefit) of executing a certain alternative, the less likely it is to be chosen. This model views organizations as entities with codified operational practises and standard patterns of behaviour. Decisions made are therefore not deliberate choices of leaders but rather outputs of pre-established systems. If you want to influence decisions being made under this model, you have to change organizational practises in advance. This model views outcomes as emerging from ‘perceptions, motivations, positions, power, and manoeuvres of principal players’ (p. 630) within an organization. If you want to influence decisions being made under this model, understand internal politics of the organization. Who are the key decision makers? What do they really care about/what are they key concerns/what are their real agendas? Who has biggest influence over them? How can you form a powerful internal coalition to support your idea? None of the models is perfect. The first one for example assumes that agents are rational which we know they are not and that organizations have only one set of objectives. The second one assumes absence of active decision making when unexpected situations occur and relies only on standard situations. The third one assumes decision making is all about politics and not about maximizing real benefits for an organization (here it is perhaps closest to the reality). These models do however provide three distinct perspectives on decision making processes. I think it is beneficial to apply all of them in turn to a problem at hand as interesting insights about how to solve it/influence it might emerge. The full paper can be found here. Another interesting person who recently spoke at the LSE was Stelios, the founder of Easyjet (and an LSE graduate). Here are some of the notes I took during his speech. They revolve, albeit perhaps unintentionally, around the concept of Antifragility as developed by Prof. Thaleb and as outlined in my previous post. The world we live in is inherently volatile and unpredictable and therefore we need to structure our businesses in a way which would allow them to withstand this volatility. Stelios does not believe in research, he prefers to learn by trial and error. Invest a (relatively) small sum, see how it goes and learn from it. Closely related to this is his second piece of advice – do not bet your farm. Learning by doing is all good but do not make a bet you cannot afford to loose. Antifragility pertains also to his choice of industries to get into – the best markets are those benefiting from volatility. If the economy slows down, people start trading down and will fly Easyjet as opposed to legacy carries. If the market goes up, more people will be able to afford to travel and Easyjet will benefit as well. He was in a shipping business before which is very commoditised and when the market went down, everybody suffered. The founder of Living Spaces, a room letting agency in London, spoke recently about a similar idea. It is best to focus either on the bottom segment of the market because if your product is relevant, the worst thing that can happen is that people will trade down, or on the other hand on the top segment where margins are fatter and better insulated from day to day volatility. Finally, Stelios said that hard work breeds luck, a bit of cliche but a true one and that a good age to start a business is 28. By that time, one would have completed his/her studies, have worked for a couple of years and therefore would have identified what he/she is passionate about and are his/her strengths to build on. Prof. Nassim Taleb gave a talk last week at the LSE on his new book – Antifragile. It is essentially about how to live a volatile world as defined by him in his earlier book – The Black Swan. I read most of The Black Swan and went to the talk so here is my take on it. Let me start by telling you a story Prof. Taleb presents in The Black Swan. Imagine you are a turkey. Every day a man comes to feed you and over time, you really get to like him. He gives you food and looks after you and therefore you conclude he must be a nice guy. One day however, he kills you and eats you for his thanksgiving dinner. How come you were so fatally wrong? It is because you, same as most other ordinary people as well as experts, based your judgement on retrospective analysis. Things always appear to be orderly and seemingly logical when looked at retrospectively – we start suffering from an illusion of understanding. This is because we base our thinking only on what we know which are only things that happened in the past and equally importantly, things that somebody was able to/took the effort to note down. The problem comes with trying to predict what has not happened yet. Prof. Taleb concludes that it is virtually impossible to do so and that if we attempt it, we can experience phenomena of Black Swans. People thought for centuries that swans can only be white as all swans around them had been until somebody found black ones on a remote island. A modern day equivalent would be for example the 2008 global financial crisis which nobody was expecting and therefore did not prepare for it and which had severe consequences. So if we cannot predict the future, what should decision makers do? This is where his book on antifragility comes in. We can image the world as consisting of two basic systems – fragile and antifragile ones. A glass is an example of a fragile system. If exposed to volatility, it cannot become any better, it will remain being a glass, and if exposed to significant volatility or stress it will break. Our body on the other hand, is an antifragile system. If exposed to stress up to a certain point such as in a gym or by application of a live vaccine, it becomes stronger and therefore more able to cope with such situation in the future. We should therefore attempt to build systems which can benefit from volatility. Such systems can gain strengths from fragility of its components as is the case e.g. with the aviation industry. Whenever a plane crashes, others learn from the mistakes and prevent them from happening again. Such systems also often rely on trial and (small) error for learning rather than on predictions. Stelios, the founder of Easyjet, who spoke at the LSE couple days later said that he does not believe in research – he claims to learn by trial and error as well. See my next article for some more relevant ideas by Stelios. Prof. Taleb also thinks that some volatility in our world is necessary, just as our body needs to stretch every now and then and cannot lay in a bed all the time. He extends this to policy makers and argues that it is a mistake to smooth things beyond the necessary. Perhaps Europe’s labour and welfare systems can take a lesson here. Do not spend too many resources on trying to exactly anticipate the future and rather invest them in building systems robust enough to withstand volatility, to learn from it and capable of utilising those leanings. As a follow up to my previous article on entrepreneurship, here is one more great advice I keep hearing a lot lately, last time from Sunny Midha, a successful entrepreneur, a tech venture capitalist and LSE graduate. And the advice is – get on the phone! If you want something, you need to ask for it. If you have the courage and determination to call up a big guy and ask him for help, odds are you will be able to make use of that help as well. Equally importantly, get on the phone to your potential customers to test if the idea you are thinking about would be of an interest to them. Have they bought anything like this before? Why yes, why not? Last but not least, it’s a great way to get a job as well. One management consulting head hunter and a friend of mine, gave a talk earlier this week on getting into the industry. One of his top advices was to read related press and if a partner from an organization you want to work for has an article there or is quoted, get on the phone to his company and say you want to talk to XY about his recent article in Z. His/her assistant will probably put you through and the partner will be delighted you read the article and found it interesting enough to enquire more. Towards the end of the call, say you are considering your next career steps and got really interested in this segment of the industry. ‘Can you help me please?’ pause… While she will not probably offer you a job outright, people rarely give you a straight no as well. She might recommend you to their HR or to a friend from another consultancy in the sector which is hiring right now. I have started my MSc Decision Sciences degree at the London School of Economics this week and one of the great things about LSE is that it attracts a wide range of remarkable speakers who come and give public lectures on the campus. I have missed out on Kofi Annan but managed to attend Gurbaksh Chahal’s lecture. He dropped out of high school at the age of 16 and by the time he was 25 he built and sold two companies worth over $340 million dollars in total. Being now slightly over thirty, he’s now building a third one, already valued at over $500 million. Here are some of his ideas on entrepreneurship I particularly liked. to scream or enjoy the ride. I really like this one. Many people have great ideas, but they never get down to realising them. Some people guard their idea, afraid somebody would steal it. I think that sharing your ideas with others can open you many unknown doors and provide you with valuable feedback and help with execution. Gurbaksh argued that the first 15 to 20 people you hire will define DNA of the whole organization which will in turn determine if the company will remain a small one or will grow successfully. One bad hire not dealt with quickly can destroy the company – so he recommended us that if we make a hiring mistake, it is OK to fire the person the first week or even the first day. People will intentionally or unintentionally question your ability to succeed. You need to get over it and not get put down by it. Ignore it; create your own reality (this was coming up a lot also in Steve Job’s biography I was writing about some time back – he called it distorted reality – you persuade people around you that impossible is possible until it becomes reality). He encouraged us to overcome any fear or insecurities we might have and just get on with things, keep trying and learning from what we do. Data on its own have only limited usefulness. It is only when we interpret them as information that we can understand what they actually mean. Consider a company knowing somebody’s date of birth. Unless we know also the date of this year and we are able to subtract those two to get the age of the customer, the data would be useless. Once translated into information (age), the company can tailor its proposition by e.g. offering a youth discount. That was easy, but how to make sense of huge amounts of seemingly unrelated data organizations are amassing these days? The Economist published in May a very interesting article on big data and new businesses focusing on this market. Especially big banks are making use big data to detect fraudulent transactions. They collect lots of data about each transaction such as the amount, date, location or name of the sender. If everything was ok, the data would have certain patterns and would not deviate from them in the short term in a specific way. People would be depositing certain amounts of money in city A and sending e.g. 3% to city B in another country. Sometimes there are exceptions, but those happen on random basis. When analysing big data, companies therefore focus on deviations from standard patterns and focus on new emerging ones. If there are suddenly lot of transactions from the one city to another one, it raises a red flag to be investigated. I was reading this article when I was still living in China and thought how else can this concept be used. And I came up with one example. I lived in a city called Suzhou and every Friday evening took a train ride to Shanghai and returned back late on Sunday. When buying tickets I had to show my passport and they noted its number. If I was working in China on an incorrect visa, I would be in trouble. As an application of big data analysis, the Chinese authorities can for example track passport numbers of train passengers and look for patterns where there should be none. One would not expect somebody with a tourist visa to be making regular trips over two months – such person should be travelling randomly across the country. Unsure of how sophisticated they are I started using my driving license which looks similar to Chinese id card instead of my passport every now and then, just to be on the safe side. Can you think of some other situations where you can find patters and how this information can be used? Crowdsourcing is a way of connecting online workers with people needing to get a simple but time consuming work done quickly and cheaply. Tasks are posted through online job-boards where individuals from around the world can apply to do them on-line for a fee offered by the contractor. The most popular one is Amazon’s Mechanical Turk named after an 18th-century chess-playing machine in which a human secretly moved the pieces. The Economist recently published an interesting article on how this concept can be used for example in social research by employing volunteers globally to participate in psychological experiments. When I was choosing a charity to donate to through OneLeap (see my previous post), I came across an amazing organization called Samasource which extends the concept of crowdsourcing to people in emerging countries – calling it microwork. Through its network of computer hubs, it allows capable yet poor people to complete simple tasks such as typing up business cards or basic database management. Companies give Samasource work to be done, it than chops it up into small tasks and sends them to poor people in their network for completion. Once finished, it than checks the results, puts them back together and sends the finished work to its clients. While saving costs to large companies, it most importantly greatly improves employment and earning opportunities for otherwise poor people disconnected from the global job market. You can have a look at their website here. I just came across a really interesting website offering connections to people who would difficult to contact otherwise. Users create a profile summarizing their experience and interests and select a charity their would like to receive donations. If you want to contact them, you have to donate money to their chosen charity (they set the amount) and than you can send them max 400 word message. If they reply within ten days, charity gets 80% of the funds, if not, you get your money back. I like how it uses our satisfaction from helping a charity to connect people together. It is get getting high-profile media coverage so really interesting people are signing up. You can sign up here, I have already created my profile! Should you be a customer or an active shaper of the system? When is help really helpful? Kyle Zeman on What’s your problem? Thamim :) on Timeless advices? © 2019 Daniel's blog. All Rights Reserved.